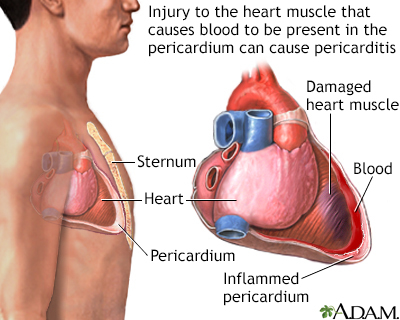 Pericarditis is inflammation and swelling of the covering of the heart (pericardium). It can occur in the days or weeks following a heart attack. 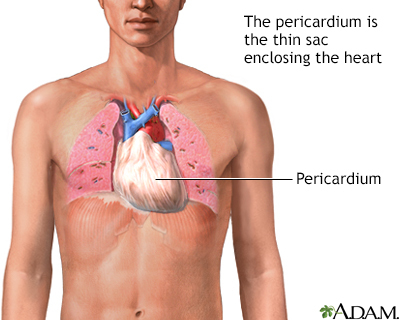 Two types of pericarditis can occur after a heart attack. Early pericarditis: This form most occurs within 1 to 3 days after a heart attack. Inflammation and swelling develop as the body tries to clean up the diseased heart tissue. Late pericarditis: This is also called Dressler syndrome. It is also called post-cardiac injury syndrome or postcardiotomy pericarditis). It most often develops several weeks or months after a heart attack, heart surgery, or other trauma to the heart. It can also happen a week after a heart injury. Dressler syndrome is thought to occur when the immune system attacks healthy heart tissue by mistake. Chest pain from the swollen pericardium rubbing on the heart. The pain may be sharp, tight or crushing and may move to the neck, shoulder, or abdomen. The pain may also be worse when you breathe and go away when you lean forward, stand, or sit up. The health care provider will listen to your heart and lungs with a stethoscope. There may be a rubbing sound (called a pericardial friction rub, not to be confused with a heart murmur). Heart sounds in general may be weak or sound far away. A buildup of fluid in the covering of the heart or space around the lungs (pericardial effusion) is not common after a heart attack. But, it often does occur in some people with Dressler syndrome. The goal of treatment is to make the heart work better and reduce pain and other symptoms. Nonsteroidal anti-inflammatory drugs (NSAIDs) or aspirin may be used to treat inflammation of the pericardium. A drug called colchicine is often used with these medicines. Steroids are commonly used for Dressler syndrome. In most cases, they are not used for early pericarditis because of these medications may interfere with normal healing and result in complications. In some cases, excess fluid surrounding the heart (pericardial effusion) may need to be removed. This is done with a procedure called pericardiocentesis. 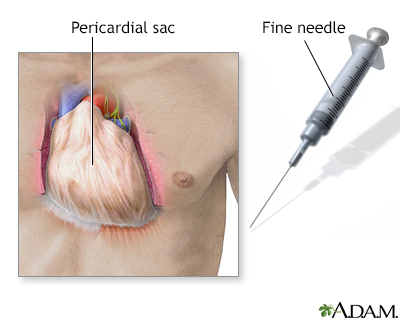 If complications develop, part of the pericardium may need to be removed with surgery (pericardiectomy). The condition may come back, even in people who get treatment. Untreated pericarditis can be life threatening in some cases.